Adding variety to your workout can prevent boredom and keeps your body guessing so you continue to see results. A stepper is one of many options available in most gyms. It consists of two foot platforms that alternately rise and fall as you step, handle bars and a displays that reflects steps taken, heart rate, distance and time. Learning the many benefits of a gym stepper might help motivate you to actually get on it. Your body's ability to lose weight is largely dependent upon burning more calories as energy than are consumed. Combined with a sensible eating program, regular exercise on a gym stepper will help you lose weight. 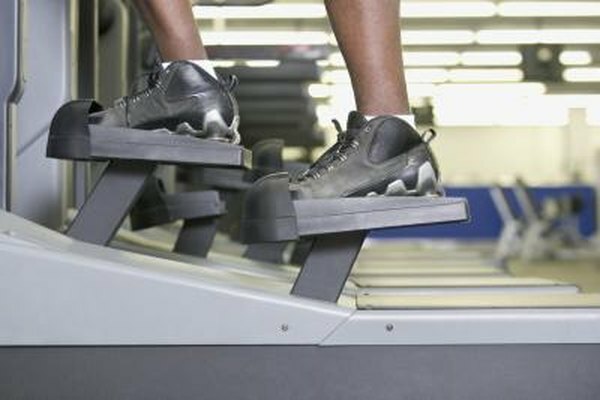 Using a gym stepper machine for 30 minutes burns 266 calories for a 185-lb person, and 223 calories for a 155-lb person, according to Harvard Health Publications. Aerobic exercise basically refers to any exercise that increases your body's need for oxygen for an extended period of time. Exercising on a stepper raises your heart rate into the aerobic zone and increases its efficiency. According to the Department of Kinesiology and Health at Georgia State University, your body will be supplied with more oxygen and nutrients and your energy levels will increase, resulting in better performance during sports, work, or recreational activities. The stepping action on a gym stepper creates resistance for your leg muscles, and over time you will notice more tone and definition. Most stepper models allow you to adjust the tension and make even greater resistance. Regular aerobic exercise on a stepper helps to stimulate brain chemicals that are responsible for feelings of well-being and relaxation, according to the Centers for Disease Control and Prevention. It can also help by changing your appearance, which may give you a confidence boost. Gym steppers are relatively easy to use, and don't require any complex moves or extra equipment. This can help you clear your mind as you exercise. Steppers are also very low impact and easy on your joints, as your feet don't actually leave the platforms during the exercise.